Employment growth among jobs in the STEM field varies widely. According to the Department for Professional Employees, the number of job opportunities for aerospace engineers increased by 53% between 2005 and 2015. Within the same period, the number of jobs for biologists and computer programmers fell by 28% and 17.4%, respectively. Pay within the STEM field also varies by occupation as well as location. For the third year in a row, SmartAsset ranked the top metro areas for pay among STEM professionals. This is SmartAsset’s third annual study of the best cities for pay in STEM. Read the 2016 version here. To find the best places for pay in STEM, SmartAsset collected 2015 data (the most recent year for which data is available) from the Bureau of Labor Statistics (BLS). We looked at 53 U.S. metro areas with at least 30,000 workers across three categories of STEM jobs: life, physical and social science occupations; computer and mathematical occupations and architecture and engineering occupations. For each metro area, we took the median pay for employees in each category and calculated the average pay for employees across all three categories of STEM occupations. We also calculated the increase in the average pay (across all three categories of STEM jobs) between 2014 and 2015 for each metro area. Then we ended up with two factors: the average pay in STEM professions and the annual increase in STEM pay. Finally, we ranked each metro area by comparing our two factors to the national average (giving 80% weight to the average pay for STEM workers in each metro area and 20% weight to the annual increase in pay). In short, our analysis looks at the metro areas that are the furthest above the national median for both STEM pay and income growth. Moving for a job? Figure out if you should rent or buy a home. STEM pay is still highest on the West Coast. For the second year in a row, STEM workers in the San Jose metro area have the highest annual salaries within the industry. STEM pay also remains high in the San Francisco and Oakland metro areas. It pays to be a physicist. In seven of the top 10 places for pay in STEM, physicists have some of the highest median salaries among STEM workers. Computer network architects also earn a nice chunk of change in most of the places that ranked at the top of our list. The larger the STEM workforce, the higher the pay. In every metro area where STEM workers make up more than 12% of the workforce, the average pay is higher than $80,000. Top STEM jobs for pay: computer and information research scientists ($154,160 median annual income), software app developers ($147,220), computer network architects ($144,670). Notable STEM Employers: Google, Facebook, Apple, Intel, Adobe Systems, PayPal, Tesla, eBay. For the third consecutive year, the San Jose metro area ranks as one of the top places for pay in STEM. Last year, it took the ninth spot on our list. It moved up significantly in the rankings thanks to a bigger change in annual income growth for STEM workers. Between 2014 and 2015, average pay across three broad categories of STEM occupations rose by 3.5%. A typical STEM worker in the San Jose metro area earns $105,920 per year. Top STEM jobs for pay: physicists ($148,890 median annual income), medical scientists ($131,750), aerospace engineers ($111,300). Notable STEM Employers: Hyland Software, NASA Glenn Research Center, HWH Architects Engineers Planners, GPD Group, Middough. Cleveland was once a major part of the manufacturing industry. But the city has changed over time as more startups and tech companies have moved in. The Cleveland metro area had the highest annual income growth in our study among STEM professionals. Average pay rose by 6.4% from 2014 to 2015. A typical STEM worker earns around $69,693. Top STEM jobs for pay: computer network architects ($139,110 median annual income), computer hardware engineers ($137,790), software developers – systems software ($130,610). Notable STEM Employers: Twitter, Dropbox, GoPro, Jawbone, Uber, Airbnb, Craigslist, Salesforce.com, Square, McKesson Corp. According to BLS data, there are more than 120,000 STEM workers in the San Francisco metro area. That means that STEM professionals make up 12.15% of the workforce. Out of the three types of STEM jobs that we considered in our analysis, employees with computer and math-related positions earn the most money, on average. In 2015, a typical worker with one of those jobs earned $109,790. Top STEM jobs for pay: physicists ($133,670 median annual income), engineers ($113,950), computer network architects ($110,400). Notable STEM Employers: Arrow Electronics, Brookhaven National Laboratory, CA Technologies, Symbol Technologies, ChyronHego Corporation. New York City is known for its burgeoning startup scene. But Long Island has become a major destination for tech companies in its own right. Dozens of companies are headquartered in Nassau and Suffolk Counties. And each year, Long Island Tech Day gives investors and job seekers a chance to see what local tech employers are up to. When it comes to pay for tech workers and other STEM professionals in the Nassau-Suffolk metro area, the average annual salary is slightly higher than the national median. A typical STEM worker raked in $74,597 in 2015. Top STEM jobs for pay: physicists ($140,870 median annual income), biochemists and biophysicists ($131,180), computer network architects ($128,170). Notable STEM Employers: Pandora, Ask.com, GT Nexus, Pac-West Telecomm, Clorox, AMCO Chemical, SUMO Scheduler. Coming soon: Uber. Since 2014, average pay for STEM professionals in the Oakland metro area has increased by 2.3%. A typical worker in the field earns around $93,670. Even though Oakland is an emerging tech hub, STEM workers only make up about 8.6% of the workforce in the metro area. But that could change in the near future. Local schools are making an effort to focus on science, technology, engineering and math. And most recently, Salesforce donated more than $2 million to STEM programs in Oakland public schools. Top STEM jobs for pay: physicists ($131,700 median annual income), computer network architects ($116,590), chemical engineers ($116,310). Notable STEM Employers: Tesoro, Boeing, Valero Energy Corporation, Toyota Motor Manufacturing, Southwest Research Institute. Coming soon: Google Fiber. The average salary among STEM workers in the San Antonio metro area is $68,233. That’s lower than the national median and less than what their counterparts earn in the Dallas, Fort Worth, Austin and Houston metro areas. But between 2014 and 2015, STEM workers living near San Antonio saw their pay grow at a higher rate than in other places in Texas. In just one year, incomes grew by nearly 5%. Top STEM jobs for pay: physicists ($125,160 median annual income), computer and information research scientists ($123,630), engineers ($116,740). Notable STEM Employers: NASA’s Marshall Space Flight Center, Boeing, Science Applications International Corporation, Lockheed Martin, Verizon, AT&T. The average STEM worker in the Huntsville metro area made $83,870 in 2015. Within our study, that’s the eighth-highest average salary for professionals across the industry. Best of all, since the cost of living in the cities around Huntsville is low, their dollars go further. A typical STEM worker would only need to spend about 12% of her income on housing-related expenses. Check out current mortgage rates in Alabama. Top STEM jobs for pay: physicists ($134,130 median annual income), computer network architects ($111,150), health and safety engineers ($104,340). Notable STEM Employers: Detroit Labs, Quicken Loans, General Motors, Fiat Chrysler, Lear, Ford, General Electric, Visteon. The Detroit metro area ranks as the eighth-best place for STEM pay in the 2016 and 2017 editions of our study. It also rates as one of the top places for women in the tech industry. There are 55,280 STEM workers in the area and a typical professional in the field earns around $76,667. Top STEM jobs for pay: petroleum engineers ($141,010 median annual income), nuclear engineers ($125,450), physicists ($123,950). Notable STEM Employers: Boeing, United Continental Holdings, Exelon Corporation, Groupon, GrubHub, Patrick Engineering, AAR Corp.
Income growth for STEM workers in the Chicago metro area between 2014 and 2015 was 3.7%. That’s a little more than twice the national average. STEM professionals make up just 5.4% of the local workforce and earn roughly $74,243 per year. Chicago is another city that’s striving to expose more youth to opportunities in STEM fields. The Chicago Public School System has a number of STEM schools for elementary and high school students. There are also nonprofits like Girls 4 Science and organizations such as Kids STEM Studio, which introduces children as young as 5 to robotics, engineering, coding and science. Top STEM jobs for pay: aerospace engineers ($146,330 median annual income), mathematicians ($138,660), petroleum engineers ($138,240). Notable STEM Employers: NASA, U.S. Army Corps of Engineers, Northrop Grumman, U.S. Naval Observatory, Upskill (formerly APX Labs). 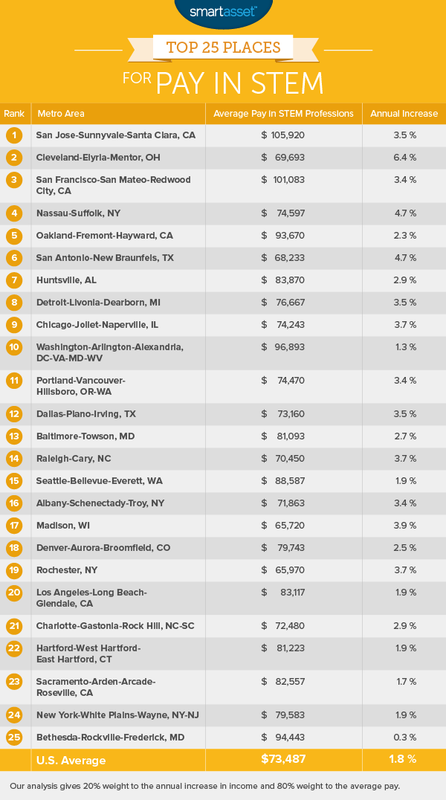 The Washington D.C. metro area ranks as the 10th-best place for pay in STEM. There are more than 270,000 STEM workers in the area and a typical employee makes around $96,893. Last year, Washington D.C. ranked as a top city for diversity in STEM and the No. 1 city for women in tech.